A very special, rare and expensive khukuri knife; a collector's dream I an ideal gift and a perfect piece to decorate a space..
Buffalo Horn Handle: This is a very exclusive and expensive knife because of the material used for the kukri sheath and the handle. 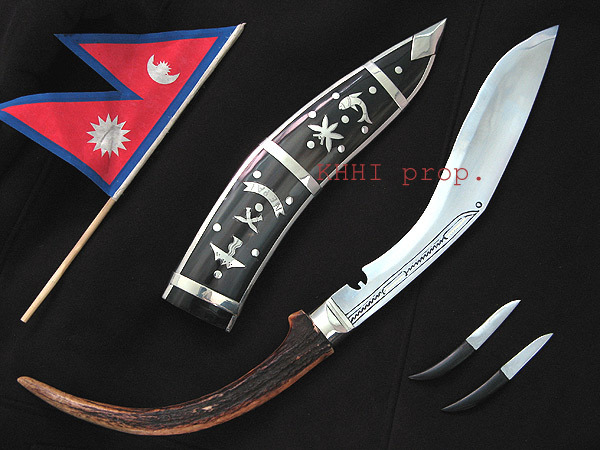 The White Buffalo Horn used for the khukuri is very rare and its difficulty in availability make this kukri so special. At times the horn is so white that the blade is visible through its case thus the name. Deer Horn Handle: Similarly, the DhanKute White’s deer horn handle is another important aspect of the knife. Deer horn is fitted to the blade that gives the khukuri a natural and splendid look; appeals an eye for at least a glance. "DhanKute White" is a collector’s dream come true, an ideal gift and a perfect piece to decorate a space. It also has a decorative fancy scabbard like that of any Dhankute kukris. Adorned with Nepalese national symbols overlaid on its front panel the craftsmen craft special scabbard out of buffalo horn. The national symbols may vary from one scabbard to another but most of the time we can find national bird , national flower , national fish, Gurkha insignia (khukuri cross), sign of a temple, the holy sword etc. The basic objective is to introduce our national symbols through our national knife itself. Commoners use it as a decorative tool because of its elegant and delicate look. The blade is slimmer and lighter than the army types. It comes in both, Chainpure and Sirupate type blades. The size of blade entirely depends on the size of the natural horn available when making. DhanKutes are typical working knives too but since they are made for display purpose and demand to be displayed to decorate a space, DhanKutes are mostly kept in shelf or stands. "DhanKute White" is a collector’s dream come true, an ideal gift and a perfect piece to decorate a space.